I've been busy lately, so you'd better believe I have a lot of new and beautiful things to tell you about today! Firstly - I can show her now that she's made her debut - she has however SOLD - my beautiful "Femme Fatale" original painting! Click here to see her in all her glory. 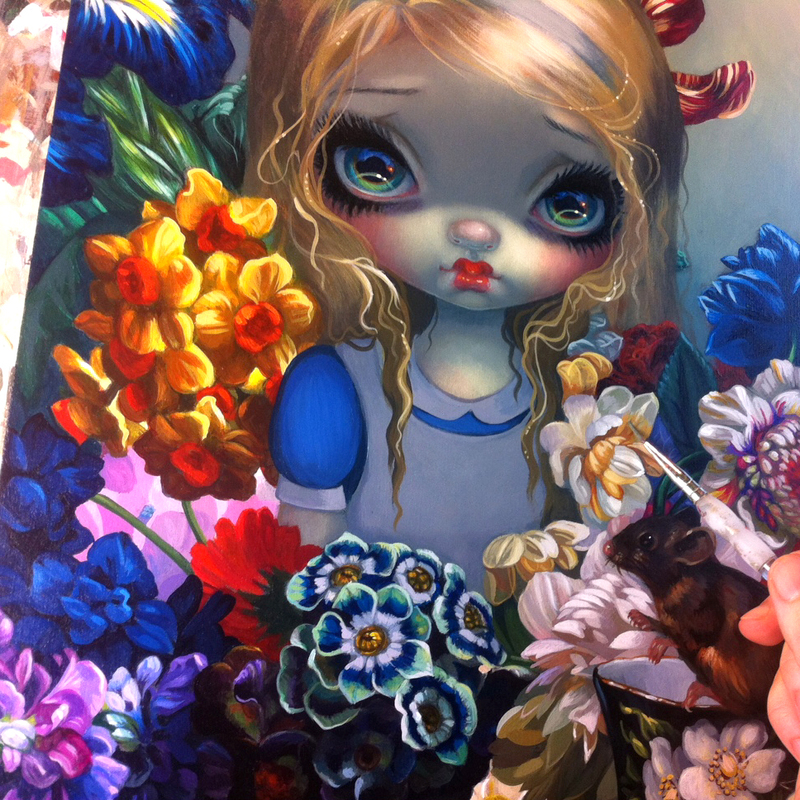 Be sure to check out the rest of the show too, a lot of gorgeous work up there, she'll be hanging at Modern Eden Gallery in San Francisco through October 8. Thirdly - something actually available! 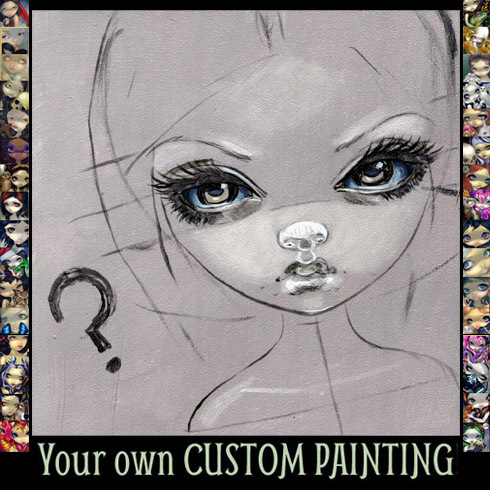 I have finally gotten the chance to put up one of my beloved "Custom Painting Auctions" here on eBay - one of the public's rare opportunities to get their own custom original painting from me, part of my Faces of Faery series. Details here. Next up - it's ACEO time! Now that I'm back home (for a little while at least!) I've been able to make some new ACEO cards, each is one of a kind, numbered #1 of 1. 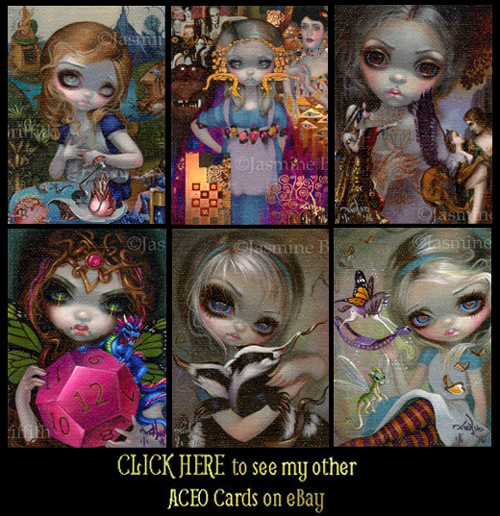 You can see all the new ACEO cards here. And finally in other news, I've added a lot of new events to my upcoming show schedule! The Kansas City Renaissance Festival is up & running in full swing! I'll be there in person October 1, 2, 8, and 9) details here. Florida people - I will be doing two new events at the Marketplace Co-Op at Disney Springs - November 12 and December 3rd. I'll also be doing a Dragon themed show called "December Dragons" also at Disney Springs at the Pop Gallery on December 17. UK folks - I'll be at the Whitby Goth Weekend November 4-6, and have just been announced as a guest at 3 Wishes Faery Festival in Cornwall next June 16-18. Details are up at my event page here. 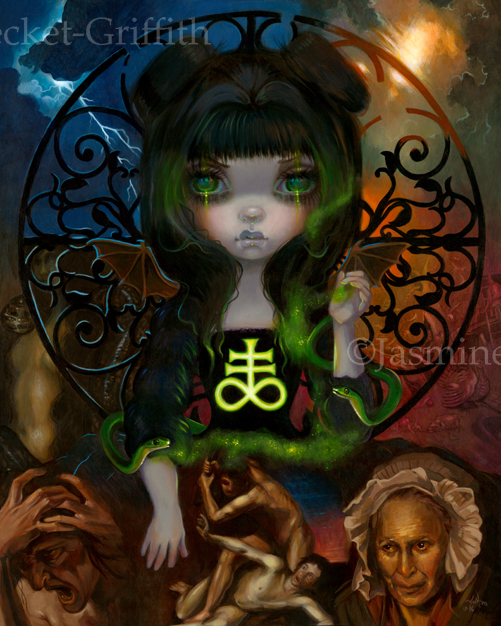 The fifth of my “Seven Deadly Sins” collection of my “Unseelie Court” series – “Envy!” This is part of my Seven Sins subseries of my Unseelie Court collection, this one of course is the allegory for “Envy.” Being envious, I of course HAD to give her green eyes. As with all my Unseelie Court pieces, there are several art history references in there – Gericault, Bruegel, Franz Von Stuck, Bronzino, more. All touching on themes of Envy or the symbols of Envy (the association with leviathan – the glowing symbol on her dress) serpents, and more. This piece debuted as part of the 2016 DragonCon Art Show. The original painting has sold, but we have prints & canvases available. We have 8x10" and 12x16" glossy paper prints signed on the back by me for $9.99 and $19.99 this week, as well as GORGEOUS 12x16" open edition remarqued canvases, ready to hang, signed COA, only $100 on sale this week. All are right here, just use the dropdown box under Fine Art Print Options to choose what type/size of print you'd like! We have SOLD OUT already of the Masterpiece Limited Edition canvases (they are $595, 16x20", full sized, hand embellished by me paint, and an edition of only 5), however the #1 and the #5 will go up for auction on eBay to give everybody a chance. It's been a while, but I've decided to do another Custom Painting Auction! Click Here for all the details photos, instructions, questions answered, etc. and to bid! And yes, you get the actual original painting itself of course too. Auction ends on September 29, 7pm EST, bidding starts at a penny. 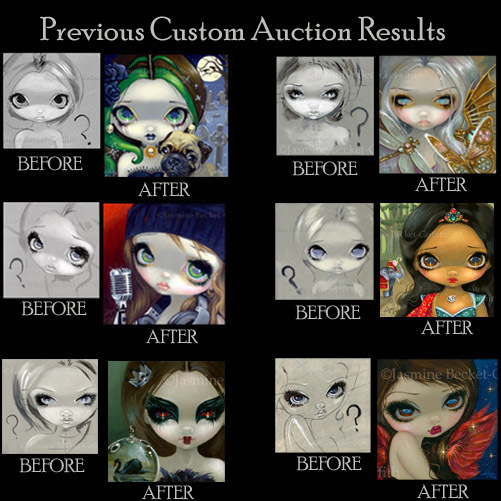 Check out this link for details and photos of the results from other custom painting auctions! 6x6" acrylic painting on panel. Worldwide shipping. Enjoy! "Femme Fatale" - I LOVE this one, her eyes are even prettier in person. As with my other faux-pixellated "censored" paintings - yes, this is what the painting looks like - no, it's not done with a computer, no it's not blurred out, I've painted all the little squares myself. Kind of got an Eve / Cleopatra idea (the snake is based on the one in Winter's 19th Century Cleopatra) emphasizing the Femme Fatale theme of the show. The gallery has just informed me that she is sold, but you can check her out above (and be sure to look at the rest of the show too, some amazing artwork!). She'll be hanging at Modern Eden Gallery in San Francisco through October 8, and after that we will have prints up at my website. I have a new batch of six one-of-a-kind ACEO cards - they are each up for auction, starting at one penny - click here. ACEO cards (Art Cards, Editions & Originals) are a great way to collect artwork. Budget and wall-space friendly, they are each 2.5x3.5" in size - the same size as a baseball card or Pokemon card. Handmade by the artist! Mine are miniature canvas prints - I make only ONE per painting, thus I number them #1 of 1, hand embellish them in acrylic paints, sign, date, etc. them - itty bitty works of art, and truly one of a kind. Enjoy!